If you've been following my bandstand series, you'll recognize a traditional wooden bandstand, surrounded by vehicles, in the above photograph. It was taken in Waterloo, Ontario on November 11, 1918. If you were there at the time you would have heard shouts of victory and music blazing from the bandstand as the community came together to celebrate Armistice Day. The Great War was over and the boys were coming home. 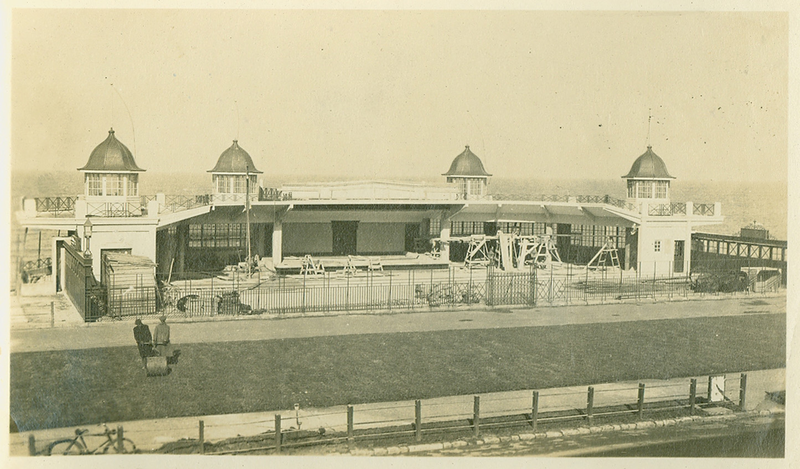 The bandstand had served its purpose on that exhilarating occasion, but sometime between then and 1920, it was moved to Waterloo Park where music continued to flow from its open walls, spilling out onto the lawns for all to hear. And what happens when a bandstand isn't big enough for its audience? You build a bandshell. 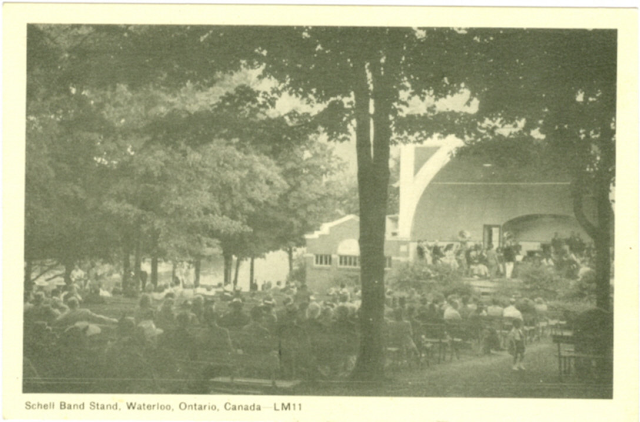 In July 1920, the Seagram family donated a bandshell to Waterloo Park. 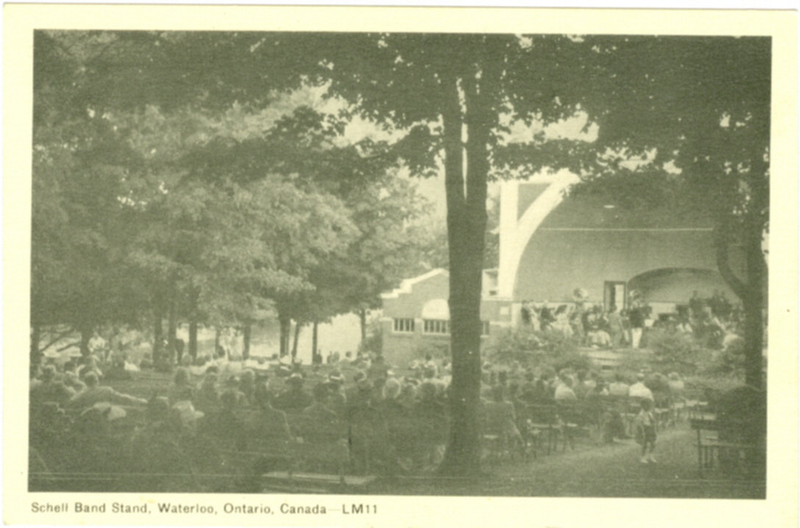 It was the first bandshell built outside of Toronto and it meant bigger bands and louder music to reach more of Waterloo's appreciative public. Long benches were provided, although many sat on the ground or brought their own folding deckchairs. And then in 1969, the bandshell was replaced by a swimming pool. 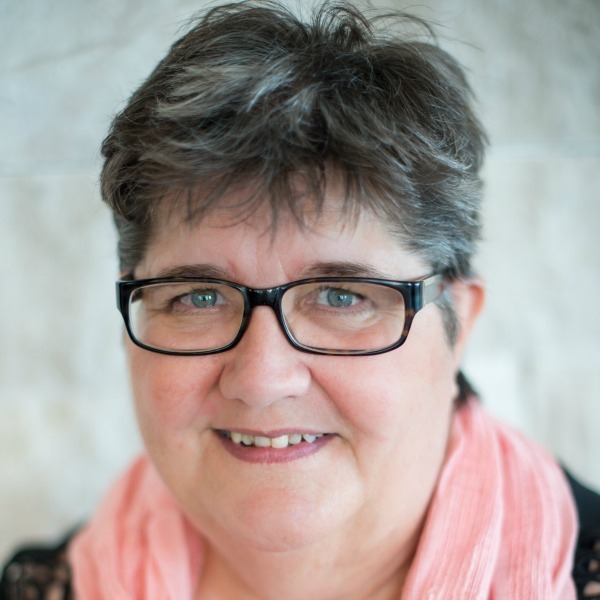 It sounds harsh, but it shows the changing needs of a growing community. In the west, along with the elaborate parks we saw in Calgary, Alberta in my last post, the City of Calgary signed a special agreement with the Canadian Pacific Railroad which enabled the establishment of Central Park with a pavilion that featured a bandshell. 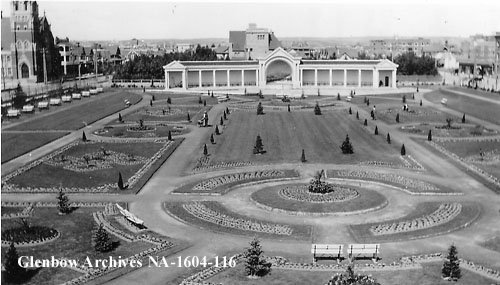 Although Calgary's Central Memorial Park, as it is now known, is still there today with fountains, sculpture, monuments and a library, the bandshell is nowhere to be seen. 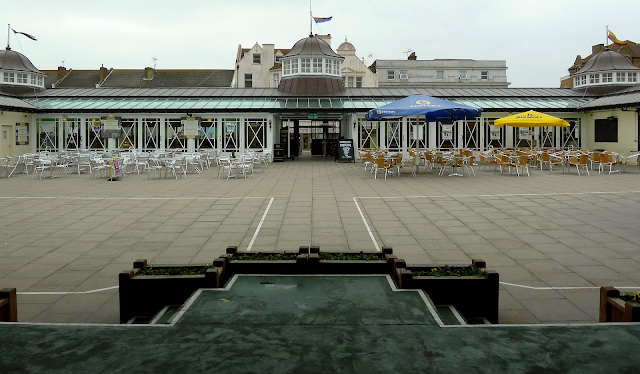 Over in the United Kingdom in 1924, a similar bandshell called the Central Bandstand, was built in the coastal community of Herne Bay, Kent, England. It was constructed of reinforced concrete with its pillars deep in the sand beside the roadway for maximum exposure with the tourist trade. 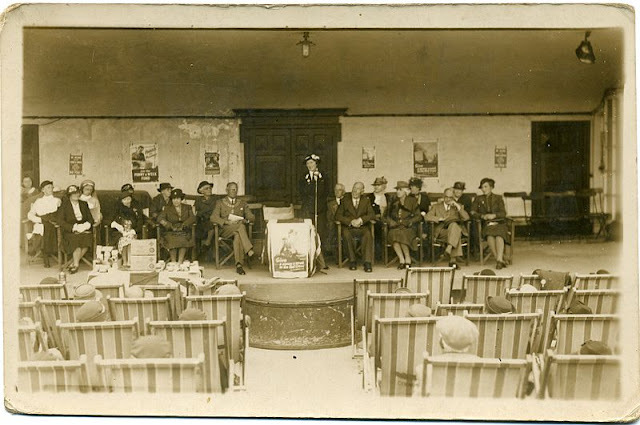 It was also known as the New Bandstand to differentiate it between an older bandstand down the beach*, and was used for speeches as well as concerts. Today, you can still take in a concert at the Central Bandstand at Herne Bay, and maybe enjoy a dance or two.The Central Bandstand has enjoyed a refurbishment in recent years which enclosed all sides to create an open-air courtyard. In this next image, instead of looking at the bandstand stage, we're looking out from the stage, across the audience chairs, and toward the doors which lead to the road. Whether you call this a bandstand or bandshell, the music that flows into the air surrounding the structure reminds everyone of its historic presence. Care to share your thoughts on these large bandshells? If you've attended a concert at one, is the sound different than a smaller traditional bandstand? Are you aware of an American bandshell that is either still standing, or once stood? 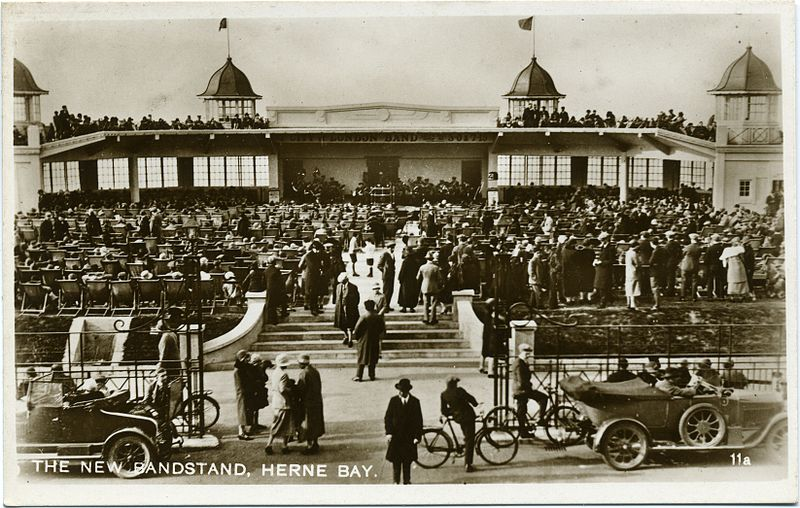 My next post will feature the other famous Herne Bay bandstand on the same beach as this one, and perhaps a few surprises to show that bandstands don't need to be demolished with changing times. Thanks for the post! Interesting! Thanks, Connie. I appreciate your visit. Very interesting! I enjoy seeing the photos, too. Thank you. Thank you, Melissa. Very glad you stopped by. Beautiful pictures, Anita. I'm so glad we have an amphitheater in one of our city parks for the summer community band to perform at along with others using it. Thank you, Anita, for this most interesting and fascinating post. I learned much from it and appreciate the photos. In my community we have a bandstand. I love the summer concerts held there, especially the concert string bands. I've posted this to my Pinterest page where I have a board on bandstands. I'm glad you mentioned the string bands, Pat. Brass bands often only come to mind when people think of bandstands, but it all depended on the talents of the community and what the public wanted to hear. You have a nice start on your bandstand Pinterest board.